It`s not Autumn here yet, still warm with cool nights. I couldn`t resist the graphic above! In fact we`re having cooling rain since yesterday. When the nights stay chilly Fall will be here soon. The best part is being able to really cook and not worry about heating up the house. Our Festival went well. The doilies I labored over sold at good prices. Entrants in the Gold Nugget Contest and Treasure Hunt were happy with their prizes and had a lot of fun. Fry Bread, Chili and potato curls were on the menu filling many a tummy. Most importantly money was raised for Feed The Children. I sometimes think people forget that children in America are hungry too. My husband runs the Nugget and Treasure hunts, I was home with a virus. Not good. 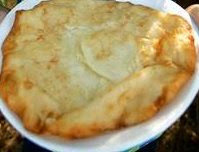 Here is a Navajo Fry Bread recipe. Not great for the hips and waistline, but it is goood!